The big news is, day before yesterday, my splint came off -YAY! I am still not allowed to put much weight on the broken foot, as it is not yet entirely healed. But I can use it for balance, can wear a shoe on it, can walk, on two feet, plus either crutches or my rolling potty chair. I've taken the pillow off the top, upon which I used to rest the bad-side (left) knee, pushing myself around with the right leg. 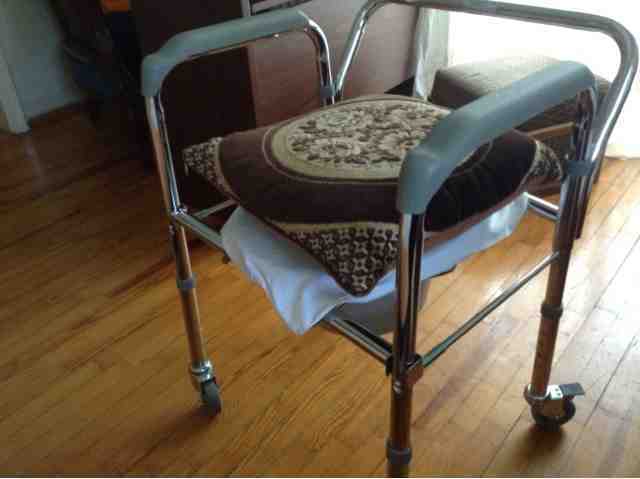 Now I use it the same way one uses a walker (Zimmer frame, if you're in the UK). I walk behind it and transport things on the flat lid Crutches work well, too, now that I can use both feet, but do not leave your hands free for carrying anything. The broken foot is now washed and scrubbed, shaved, dried, and moisturizied with creme. Ahhh! Tuesday we celebrated Phideas' 23rd birthday (our nephew) by hosting him and Christos, his father, at the taverna across the street. Phideas is taking night classes to finish up high school; this is a huge relief to Christos, who had been after his son night and day to do this. Christos is also much relieved to be living here instead of Katerini. He said he couldn't believe how bad it was for him there and that he would have just died if he had stayed there. So Demetrios' insistence upon the move has paid off. He still looks terrible, all skin and bones, so small he has to wear boys' clothing. Once he laid his head on the table and began making those horrid grunting sounds of his, but Demetrios and Phideas got him to stop that. He says he doesn't know why he does it; it feels as though it were not himself, but someone else doing it. All his physical tests have come back normal. There is noting physical to account for his terrible fatigue. Nor is it psychiatric, or his brother could help him. Demetrios says it is a matter of solving his psychological and/or spiritual issues. Well, with the move here, and Phideas back in school, and with much encouragement from Demetrios, some of those issues have been put to rest. He now has hope that he may get better, and with great struggle, he does mostly maintain a positive attitude. He gets out of the house almost every day and indulges in what he says is life's greatest joy: sitting alone by the sea drinking coffee and smoking his pipe. And here comes the corker: now that Demetrios' two patients are both significantly better, we are free to make plans for England! we only have about two more weeks of perfect weather before the oppressive, sweltering summer closes down on us. Delia Proctor (not her real name) has been around to say her goodbyes. Don't ask me how I know; some things one just does know. This is one of them, and the other thing I know is, I love her as deeply as ever. She must have been near 90. She was a high school teacher of mine, a small, wiry woman who wore straight skirts and matching shirts (not blouses), with high heels mandatory in those days, and red lipstick. Her black hair, prematurely tinged with gray, was brushed back into a hairdo then known as the Ducktail, meeting in a small, upward sweep at the back of the head. She had enormous, brown eyes. And she didn't really relate to any of us; that was the striking thing about her. Of course there is always that line between teacher and students one does not cross, but that was not the point; at least the other teachers did relate to us as human beings, while Miss Proctor never did. She ever wore a mask, like the Queen of England (of whom it is said that when her visitors are delighted to have caught her in, as they suppose, a candid moment, even that has been scripted and staged). She was formal and stiff, with great dignity of bearing, seldom if ever smiled. I even wrote a poem about her once, that was published in the school literary magazine, and its title was, "The High, Hard, Cold Wall". It bothered me greatly, to see a person like that, who, I felt sure, must be someone wonderful, trapped in that tough rind. If only she could blossom, could bloom, could learn to feel easy around us, could enjoy other people! What sort of handicap could this be? In retrospect, I feel reasonably sure most of the other kids understood it, but I, though I observed her narrowly every chance I got, was baffled. All I knew was, whatever the obstacle, I wanted to do my bit to overcome it. I became downright determined to dismantle that barricade. I never really did; you may as well know it now; but this story is about the efforts, perhaps misguided, perhaps not, that I made. It became my mission in life, almost an obsession. I began bringing gifts for her, but lest she think me ill-motivated, I recruited the whole class to act as the givers. We gave her daffodils on Ground Hogs Day, chocolates on Valentine's Day, and I cannot remember what else, but there were frequent gifts. She never knew how to receive them; the first time, she asked if this were some joke. After that, she usually exhibited a sort of embarrassed pleasure and moved on as quickly as possible to other matters. Sorting through photographs for the school yearbook I came across a lovely one of her, head bowed in three-quarters profile, eyes downcast, looking unusually dainty and even pretty. I kept it and drew, in pencil, a large portrait from it with which I was tremendously pleased, although of course I would never dare show it to her. Two of us Juniors were candidates to become Editor of the school newspaper the following year, and Miss Proctor decided to take Steve and me both to a three-day high school journalism conference at Columbia University in New York City. During that trip, I got to know her slightly better; she told me she and her roommate, Bobbie, had recently returned from a two-year stint as missionaries in Japan. Of course I was enraptured to hear this, and it confirmed my good opinion of her. If, some evening, you were to find yourself in the bedroom of the Queen, would you watch her sleep? Of course you would, because it would be a genuine candid moment, and I did the same, just watched this queenly person for as long as I could stay awake. It made her seem more human, or something. You cannot hide behind a mask while asleep. I feel asleep with happy prayers. I was vaguely amazed and surprised, when we got back and someone mentioned to me that there were rumors I was a lesbian. I didn't have a boyfriend at the time, but not from lack of interest. (The guy I was interested in was dating my next-door neighbor.) Anyway, after my initial annoyance, I found the rumor rather amusing, and laughed it off as being about as far from the truth as you could get. I still didn't make the connection. At the end of the school year, Miss Proctor apparently felt sufficiently at ease with our class to invite us all to a cook-out (barbecue) at her house. It was a small, suburban home with a very high privacy fence all around it. The inside, as she showed us the kitchen, dining room, living room, was sparsely furnished, altogether quite Spartan, and I thought at the time I admired that; there were no unnecessary gew-gaws around. She kept referring to things as "our sofa", "our dining room table, " etc. It sounded crazy to me. "You mean every item here belongs to both of you?" I asked When she nodded, I blurted out, "Then how will you ever divide up your stuff if either of you ever decides to get married?" - which of course was something I dearly hoped would happen for her. She laughed and said, "Oh, well, then we would be in real trouble!" One of the other kids gave me what I knew was meant to be a significant look, but I was at a loss to decipher the significance. What I knew was that it was a bittersweet evening as we played games, sang around the campfire, signed each others' yearbooks, and said our farewells. My farewells were to be forever, as my dad, an Army officer, had received new orders and we would be moving in a few weeks. I don't know what I had expected Miss Proctor to write in my yearbook, but all it said was, "It has been good working with you this year. D. Proctor". I only ever saw her twice again after that. We moved back to the same area after a year, and I went, one Sunday, to check out some experimental, interdenominational church, and there she was. Our conversation after the service could have been between two strangers who had just met. I came back the following Sunday. I was leaving the early service as she arrived for the late service, and all I said to her, as we passed one another, was, "Oh, here you are! Here, I have something for you," as I passed her a brown paper bag and went my way. In it was the portrait I had once made of her, and had cherished so long (and sometimes wish I still had). Ridiculous as it sounds now, it actually took me 10 more years to see through the mystery that surrounded Miss Proctor. It was a considerable relief when I did, as the solution to a vexatious poblem always is. I still regret that the human contact we had was so slight and so brief. But now she has been 'round to say her goodbyes, and I am at peace, and fervently pray she may be, too. Do not, ever, call me a homophobe. The Greeks have now been reduced almost to the status of slaves. The average worker here earns 20 Euros a day, or about $12,000 year. Last week we met a woman whose daughter is a physician, an eye ear, nose and throat specialist, who is moving to Switzerland because her pay here is 800 Euros a month, approximately $1067 dollars a month or $12,800 per year. Meanwhile, numerous tyrannical laws have been passed, all in too great a hurry to permit discussion. One of them forces businesses to open on at least some Sundays. Another says any deceased person is an organ donor, no matter what he or his family may desire, or even what their religious scruples may be. It occurs to me that the so-called Troika, which runs this cuntry and others, is not a purely European thing. It consists of the European Comission, yes, and the Central European Bank, but also of the International Monetary Fund. International, not European. The pan-cosmic government, as the Greeks call it, is not merely some conspiracy theory; it is already in place in some countries. And it is no democracy. My mother taught me to knit when I was six years old, chronically sick with tonsilitis, and bored in bed. I've knitted ever since, although I supose I only took it up in earnest somewhere along about 1986. Still, any way you look at it, I've been knitting rather a long time, and still I keep learning. Here are some things I have recently become aware of. Just as it is unwise to knit late at night, so also is it unwise to knit first thing in the morning. Do not open your eyes, grab your knitting (which of course is always within reach) and try to do a few rows before getting up. Have your breakfast first, and your coffee or tea. Especially in more complicated patterns, don't use the purl-back row just to coast and relax. Instead, use it to count your stitches. This helps catch mistakes early. Do not hum while counting sitches! Do not try to remember how the phrase goes in Greek or what the words were to that old hymn you loved when you were a Protestant. Knitting, like prayer, requires vigilance against distractions. Concentrate on your counting or your song will cause you to miscount. If you don't much feel like doing this, you may not be in the proper mood for knitting and may like to do something else for a while. Washing dishes is a chore admirably suited for humming. Stitch markers, with a known number of stitches between, make it easier to isolate and find a mistake. Suppose you know there should be 60 stitches in the row but after three counts, there really are only 59. If you know there ought to be 12 stitches between markers, you only have to find which pair contains only 11, and then it is easier to figure out why. You may, in this way, be spared having to rip out the whole row. Happy knitting, and may all your mistakes occur near the end of the row! The doctor had hoped we could remove my splint today, but no. The break is at the bottom of the picture, at the base of my small toe and as anybody can see, it has some mending to do yet. We are to go back in two weeks. Meanwhile, Demetrios has been a saint, never once complaining of having to do the housework - and, I venture to say, getting quite a education from it. I feel bad he has to do at least two more weeks of it, though. I am more mobile than I used to be, on account of having learned quite well how to use my little rolling chair, and on account of hurting much less than I did at first. Having given up on War and Peace, I am now reading Aesop's Fables instead. What a perfect delight, and so full of wisdom. Here ate two that have especially claimed my attention. THE BEASTS of the field and forest had a Lion as their king. He was neither wrathful, cruel, nor tyrannical, but just and gentle as a king could be. During his reign he made a royal proclamation for a general assembly of all the birds and beasts, and drew up conditions for a universal league, in which the Wolf and the Lamb, the Panther and the Kid, the Tiger and the Stag, the Dog and the Hare, should live together in perfect peace and amity. The Hare said, "Oh, how I have longed to see this day, in which the weak shall take their place with impunity by the side of the strong." Does This Make me a Heretic? Now is perfect weather: bright and sunny, warm, slightly cool breeze but not cool enough to call for a sweater, azure sky, and long hours of daylight. Now is the time we leave every window and door to the flat wide open. I love it. We live in close quarters here with our neighbors. When the windows are open, we not only see, but hear everything: the workman tapping with his hammer, the children at play, the clinking of cutlery as people eat their meals, arguments, conversations between people from balcony to balcony, cats yowling, dogs barking, cars passing, laundry (or our Greek flag) flapping, birds chirping. I've become more than used to it; I have learned to love it and miss it when the windows are closed. Why do I love it? Because this way, we get a real sense of the whole neighborhood, and by extension the whole city and the whole world, living one, single, common life. We are all a part of everything, all in it together (even the cats and birds), and together making up one breath-taking tapestry. In some parts of the world, this sort of thing is a profound mystical insight, a debatable philosophical proposition or a doctrine taught in books of theology; but here, it's just everyday experience, normal living, something so obvious as to be taken for granted. and infinite other things. And thou art wireless and fittest into a side pocket of my handbag! The whirl of events these past several days has put me behind some, but now I'd like to go back to the night of Great Holy Friday. Here is part of my favorite hymn from the 'Lamentations' Service. Earth covers Me by My own will. But the doorkeepers of Hades shudder and quake, seeing Me clothed in a robe spattered with revenge. WHAT? Jesus, out for revenge? And surely it is His own blood spattered on His robe? Whoever heard of taking revenge by spilling your own blood instead of someone else's? Yet that is exactly what the verse means. For this revenge is against bloodless enemies, against all the forms of evil that torment the human race. Above all, and the summary of them all, is death, but included are aso such plagues as despair, hatred, wickedness, grief, and the like. He has already overcome them on the Cross (by not giving in to them) but now he is about to abolish them for us all, by destroying their root: death. And just how, please tell, does He go about doing such a thing a that? When You, O Immortal Life, came down to death, then You killed death through the dazzling brightness of Your Godhead; and when You raised up the dead from the abyss, all the powers of heaven cried aloud; Christ, our God, Giver of Life, Glory to You. You dazzle 'em, that's how! You chase away the darkness with endless Light. You drown hatred with infinite, unconditional Love. You replace grief with unspeakable Joy. You fill up the emptiness of death with unending Life. You thereby destroy Hades (death) and transform the grave into paradise. Truly, Hades was pierced and destroyed by the divine life when received in its heart Him who was pierced in His side with a spear for the salvation of us who sing: Blessed are You, O delivering God. But wait a minute; we still die, don't we? We all still die. What is meant is, now we do not experience death as the ancients thought of it ; we do not become bodiless and ever-diminishing shades living in a shadowy underworld (Hades) without hope, without God. Nor do we experience death as it is thought of today, a condition rather than a place, a winking out into permanent oblivion. True, our spirit leaves our body, which then rots. But now that God has descended even to death, neither our soul nor body is ever separated from God. We are never separated, that is, from Life, from Love, from Joy, from Goodness, from Hope. As for our bodies, without which we are no longer human beings, though they be eaten by worms, on the Last Day, God will give us back familiar yet glorified versions of them, bodies such as the one in which He Himself arose. The tomb is happy, having become Divine when it received within it the Treasure of Life, the Creator, as one who slumbers for the salvation of us who sing: Blessed are You, O delivering God. The Life of all was willing to lie in a grave ... making it appear as the fountain of the Resurrection for the salvation of us who sing: Blessed are You, O delivering God. Today is moving day for Christos, my brother-in-law. Two men and a truck have been hired. Demetrios will help however he can, and Christos' friend from childhood, Chara, has volunteered to help, as well. We hope Christos will be more nearly happy here in town, where his friends and family can see him more often, where he can live more cheaply, where his doctors are. We hope this will help to lift his spirits. The latest guess as to his diagnosis is Chronic Fatigue Syndrome, made significantly worse by depression. In spite of the wag's remark about something being as depressing as a Russian novel, I discover that this novel is mostly about Joy. But Dostoyevsky has to bring in great sorrow and suffering to illustrate his point: that Joy shines through sorrow, shines on with or without sorrow, and conquers sorrow. I have often emphasized authentic Christianity as the religion of Love, but yes, it is also the one and only religion of Joy. I went to see Lorraine on Monday. She's the En glishwoman who runs the Mini Market across the street from us. It was my first solo outing. I can get down the curb just fine, but still needed he help getting up the curb on the other side. ??? It is? How could one tell? Why should a quickly-formed friendship necessarily be false? I have made intimate friends here in one evening, and the years have only added more proof to their true nature. Lorraine has no use for Orthodoxy, either. He first encounter with it was quite unfortunate. It was at her wedding in a Greek Orthodox Church; the priest wouldn't let the bride and groom or any of the guests into the church until he had been paid, until he had 150 Euros in his hand. I observed that this was not Orthodox, nor even Christian. At our wedding, the priest never mentioned money We slipped him a gift after the ceremony. Lorraine is also incensed (pun?) by young children being "forced" to cross themselves and kiss icons, even when they are too young understand what they are doing. I don't remember what I said in reply, if anything. I suppose the real issue is whether these things ought ever to be done at all, by anybody; otherwise teaching the children to do them wouldn't be an issue. Well, we may have some interesting conversations ahead of us - or not, if her mind is made up. Anyway, I enjoyed the hour I spent with her and hope to repeat the visit soon.